Today, the American Tree Farm System (ATFS) announced the four Regional Outstanding Tree Farmers of the Year from among more than 74,000 Tree Farmers: the Eve-Cowles families of Massachusetts; Gerald and Charlotte Kann of Wisconsin; Bobby Watkins of Mississippi; and Lyle and Dean Defrees of Oregon. ATFS, which celebrates its 75th anniversary this year, has honored more than 150 forest owners as Regional Outstanding Tree Farmers since the award’s inception in 1976. To be considered, awardees must exhibit the most exceptional forest stewardship to protect and improve forest health, wildlife habitat, clean water and sustainable wood supplies, and must promote this stewardship within their communities. One of these Regional Outstanding Tree Farmers, based on judging from AFF’s governance and online voting, will be chosen for the National Outstanding Tree Farmer of the Year award later this year. Northeast Regional Outstanding Tree Farmers of the Year the Eve-Cowles family of Conway, Massachusetts have spent more than 40 years restoring a cut-over forest and improving wildlife habitat, particularly for the declining bird species of their state. Purchasing the property in 1973, Arthur and Barbara Eve initially wanted a place for family and recreation, but soon became passionate about forest stewardship and improving their land. Over time, with the help of family work days, the Eves and Cowles have improved and diversified wildlife habitat, controlled invasive species, repaired old wood roads and trails, and protected a historic foundation of a 350-year old homestead. Today, the property is thriving with habitat for bluebirds and other grassland birds, regenerated red oak and black cherry bird habitat, and wide openings that provide breeding grounds for many declining bird species, including grouse, woodcock, white-throated sparrows, chestnut-sided warblers and towhees. Besides being excellent stewards of their property, the Eves and Cowles have also been outstanding ambassadors for forestry and sustainable land management, with their property being chosen as a demonstration site for the Foresters for the Birds program that encourages landowners to manage their woodlands to provide habitat for declining species of birds. North Central Regional Outstanding Tree Farmers of the Year, Gerald “Jug” and Charlotte Kann of Sparta, Wisconsin are great examples of what hard work and a passion for wildlife and the outdoors can accomplish. Jug purchased the property in 1973 as a traditional farm of lightly rolling hills and grasslands. Wanting ‘a place to play in the dirt,’ Jug called his natural resources professional for advice and began immediately. In the first year, he completed his first tree-planting project of 7,500 conifer tree seedlings on 9.5 acres. Over a dozen spring seasons since have seen a tree-planting, with more than 50,000 tree seedlings being planted over time. Restoring the land to forest, Jug has seen a significant increase in wildlife, especially deer and turkey, on his property. Continually wanting to care for these critters, Jug created a pond, the now only source of water for wildlife in the area. Sharing his knowledge with the community, Jug has written several articles for his state’s magazine, hosted hunting events and field days on his property, and is very active in his local forestry and rotary chapters. Southern Regional Outstanding Tree Farmer of the Year, Bobby Watkins of Aberdeen, Mississippi has perfected the art of balancing wildlife habitat and a successful timber operation. Watkins’ land has been in his family for four generations, first being a family farm that grew soybeans and cotton. Since Watkins’ inherited it from his mother, he has spent countless hours transitioning the property back to forest. Through a continuous cycle of planting, thinning, harvesting, replanting and other management techniques, Watkins has created abundant forages for wildlife, providing them with different age stands for both food and shelter. Taking it a step further, Watkins conducts trials to learn how thinning pines at different levels of growth can affect wildlife habitat in a pine stand. Today, his 240-acre tract is known in north Mississippi as an educational model for aspiring landowners. Watkins has hosted numerous workshops for neighbors, works with Extension students on research, and hosts timber buyers for educational demonstrations. Western Regional Outstanding Tree Farmers of the Year, Lyle and Dean Defrees of Baker County, Oregon are renowned for their commitment to protecting clean water and wildlife in the face of Western wildfire. Nestled in the northeast mountains of Oregon, Lyle and his son Dean have seen the damage catastrophic wildfires can have to the land, and have been working to improve and protect their 1,227-acre forest, and the water that flows through it, from wildfires for more than three decades. The Defrees Tree Farm boosts two flowing streams, three intermittent streams, one pond, six developed springs, and eight undeveloped springs. Conducting management practices themselves, Dean and Lyle continuously reduce wildfire risk by thinning and harvesting and protecting their water resources that support cattle, wildlife, fire protection, domestic use and more. The Defrees commitment does not stop at their property line. They have been extremely active in educating and activating the community as well. Recently, Dean was a leading member of the Baker County committee that collaborated with the Oregon Department of Forestry Fire Protection to update the county fire patrol assessment. The law became effective just in time for Oregon’s extremely bad 2014 fire season, with the additional funding credited with keeping the fire season from not being considerably worse than it could have been. 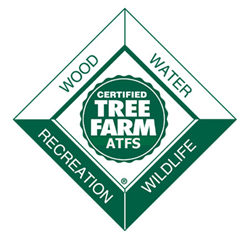 Operating across the nation, ATFS is an internationally-endorsed recognition and certification program that provides family and private forest owners with support and tools to ensure their forests deliver the clean water, wildlife habitat and sustainable wood supplies all Americans count on. In total, there are 20.5 million of forested acres within the ATFS program, across 92,000 Tree Farms. These are managed by 74,000 Tree Farmers. The Regional and National Outstanding Tree Farmers are awarded annually. This year’s award is made possible thanks in part to Weyerhaeuser.